I had to fit Porsche into this post somewhere and thankfully Ferdinand Porsche provided the ideal opportunity by designing and building the worlds first petrol/electric hybrid car very early in his design career when working for the Austrian car builder Lohner. 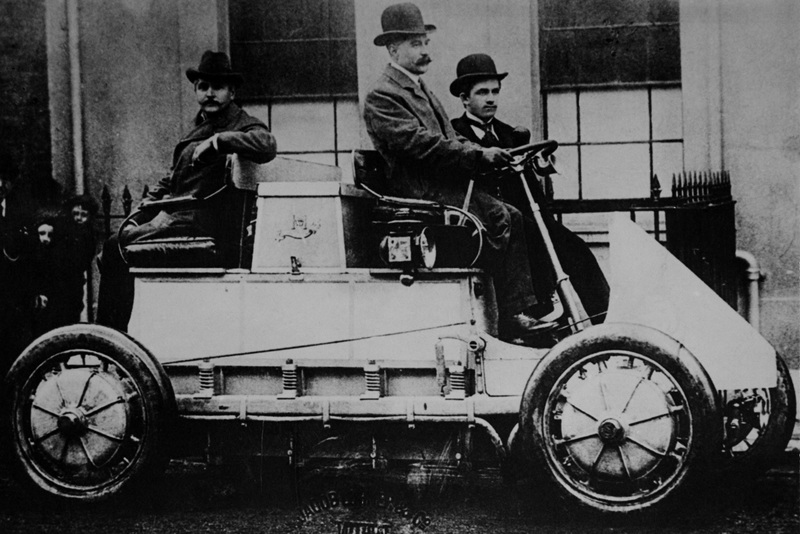 This innovative vehicle had a small petrol engine to power 4 independent electric motors – one in each wheel. Military variants were produced to deal with the challenges of transporting materials and weaponry across the muddy and uneven terrain of the 1st World War front lines. Some of Porsche’s military hybrid creations were still being used up to and including the 2nd World War. Latterly Porsche (and other manufacturers) have built upon Ferdinand’s early hybrid legacy with the introduction of radical new hybrid/energy recovery technology into their road and race cars. Porsche’s recent hybrid developments have included flywheel technology and other energy recovery/reuse devices as well as the more basic petrol/electric approach used by a number of other manufacturers. Innovative development has been encouraged by changing rules and regulations in the FIA World Endurance Championship (WEC) which require the use of hybrid and energy recovery technologies in cars racing in the top LMP1 category of the sport. This resulted in Porsche formally re-entering the Endurance Racing fray in 2014 with their 919 LMP1 car which had a promising start in 2014 against stiff LMP1 competition from Toyota, Audi and Rebellion Racing. Continuous development of the 919 resulted in a 2015 car with 85-90% new parts and this provided it with the winning edge to secure outright victory at Le Mans bringing Porsche’s total number of Le Mans wins to 17. So many Euro/American mongrels have been created over the years – it’s difficult to know where to start when describing them but these cars provide the main thrust of this post! Giotto Bizzarrini utilised the Chevy Corvette engine in his Iso Rivolta and Grifo designs and later in his Bizzarrini badged Strada and Corsa models. De Tomaso shoe-horned Ford V8’s into their Mangusta, Pantera, Longchamp and Deauville cars. Jensen, Bristol and Gordon Keeble opted for Chevrolet V8 engines. Allard pioneered the creation of Euro/US Hybrids using Cadillac and other US V8s in their 1950s L, M, P, J2 and J2X models. AC got Carrol Shelby to shoe-horn 4.7 and later whopping great 7 litre Ford V8’s into their Cobra and into their Frua designed 428 models. Sunbeam squeezed Ford 4.3 and later 4.7 V8s into their Alpine based Tiger. TVR followed suit with their 4.7 litre Ford Griffith and Tuscan V8s and Ginetta also inserted a 4.7 litre Ford V8 into their G10 model. Even the conservative Rover company bought the “compact” 3.5L aluminium Buick V8 tooling and re-badged it as a Rover engine to stick under the bonnets of their P5, P6, SD1 and other models (including the Land Rover and Range Rover). Arch traditionalists Morgan also utilised the Rover (nee Buick) V8 in their fabulous Plus 8. Facel used the Chevy V8 in their HK500. Once upon a time there was a very pretty little John Tojeiro styled sportscar called the AC Ace. The Ace offered elegant and genteel transport for cloth-capped gents of the time but even with the more sporty Ruddspeed option they were never really going to set race tracks alight. Experiments were carried out to fit a Chevrolet V8 but the unit was deemed to be too heavy for the chassis and suspension. Ken Rudd then suggested that AC management might want to buy tooling for the “compact” Buick V8 which was available for around £1m at the time but they didn’t bite. Ken Rudd was cut out of the loop. Rover took up the Buick offer instead (now rather ironic given the number of Rover V8 engined Cobra replicas!) and AC were still looking for a new power plant. Enter – Carrol Shelby who had prior experience of US V8 engined British sports cars through his experience driving for Allard. He carted an AC Ace off to the States where he subjected it to a heart transplant and he then put it on a serious course of steroids to create the fire breathing monster that was and is the AC Cobra. Shelby initially shoe-horned Ford’s 4.7 Litre (289) V8 under the AC’s bonnet but this was later replaced by the tree-stump-pulling 7 Litre (427) Ford V8 engine. AC later created a refined Italian styled GT utilising the 7 Litre Cobra chassis clothed in elegant Frua designed bodywork. Cobras quickly established themselves as highly potent and competitive club racing cars even when dicing with out-and-out race cars and they remain as front runners in historic racing to this day. Other variants were created such as the Daytona Coupe and Le Mans specials and the Cobra even went through a brief revival in the ’90s as more originally styled “sanction” cars rolled off the AC production line to the delight of a new generation of well heeled customers and collectors. Founded by Sydney Allard in 1945 – this small specialist car builder manufactured a total of around 1900 cars before the company closed after the death of its founder. Sydney Allard was arguably one of the most important and influantial innovators in the Euro/American cross breeding programme. During the 1950s his American V8 engined cars were driven by pilot, turned chicken farmer turned racer Carroll Shelby and also by Zora Arkus Duntov. These 2 automotive legends went on to build the AC Cobra and Corvette Stingray respectively. Sydney Allard was also responsible for introducing Drag Racing to the UK so there’s another Euro/US Hybrid link! Early Allard creations were Trials Specials using Ford Flathead V8s but later cars including the L-Type, M-Type, P-Type, J2 and J2X utilised a range of American power plants including Cadillac, Chrysler, Buick and Oldsmobile. The swan-song Palm Beach model mainly used European Ford 4 and 6 cylinder engines but one was built with a US V8. NB: See upcoming post – “A is for Allard”! Giotto Bizzarrini cut his engineering teeth at Alfa and then Ferrari where he was intimately involved in creating the 250GT and the 250GTO. After being booted out of Ferrari – he also created (with Piero Drogo) the 250GT derived “Breadvan” for Count Giovanni Volpi. Despite having created the legendary Lamborghini V12 – Bizzarrini recognised the potential of using mass produced American V8 engines when he was asked to assess a Gordon GT (aka Gordon Keeble) as a possible basis for creating a luxury GT for Renzo Rivolta. This resulted in the Iso Rivolta GT and later the Iso Grifo which utilised the Corvette V8 and De Dion suspension as used in the Gordon GT. Bizzarrini continued development of the Grifo design (still utilising the Chevy Corvette engine) in the guise of the Bizzarrini badged Strada and Corsa cars. His traditionally front engine cars remained competitive thanks him ticking the engines well back in the chassis and by maintain a low frontal profile. NB: See existing post – “B is for Bizzarrini”! Bizzarrini Strada engine pushed so far back it’s almost in the cabin! I always think of Bristols as being the epitomy of British gentility and style. More exclusive than Rolls Royce, Bentley and Aston Martin and with a devoted following of well heeled, discerning owners who err on the side of restoration rather than replacement. Paul Smith the British designer has been a big fan of Bristol and a Bristol owner for many years. Bristol cars was formed as a branch of Bristol Aeroplane Company with the aim of diversifying and reducing exposure to the peaks and troughs of wartime aircraft manufacture. Starting with the manufacture of light cars in the inter war years Bristol eventually struck up a relationship of the Aldington brothers of Aldington Frazer Nash (AFN) fame – then manufacturers of Frazer Nash cars and pre-WWII importers of BMW cars. Immediately post-WWII this led not only Bristol taking over Frazer Nash and securing a controlling share in AFN but it also Bristol to use Aldington’s involvement with the War Reparations Board to purchase the rights to the manufacture of 3 BMW Models and the BMW 328 engine. The rest as they say is history – a car manufacturing plant was established in Filton, Bristol where new cars were manufactured albeit under the Bristol Car Division (after the Frazer Nash brand was re-sold). Ownership of Bristol eventually passed to racing driver and Bristol agent Tony Crook who established the sole showroom and head office in High Street Kensington. Early cars exploited the BMW 326 based chassis design, 327 body and 328 engines purchased through war reparations following WWII. In homage to the origins of the 2 Litre BMW 3.0 Litre straight-6 engines early Bristol cars incorporated the BMW radiator grille design. Much to the disgust of Bristol traditionalists – Bristol swapped the ageing BMW straight 6 engine in 1962 for a Chrysler of Canada sourced 5.2L V8 in their 407, 408 and 409 models. The V8 powered 410 followed in 1966 and then the 411 with increased capacity 6.2 L Chrysler V8 in 1969. Through the ’70s, ’80s and ’90s – Bristol produced the rather patriotically named Beaughfighter, Britannia, Brigand, Blenheim (2,3 and 4) before it got into further financial straights. This Italian manufacturer was actually founded by and named after an Argentinian industrialist – Alejandro De Tomaso and at various times it also incorporated Maserati and Moto Guzzi as subsidiary companies. The 1st De Tomaso road car was the mid-engined Vallelunga which utilised the somewhat modest European Ford Cortina 4 cylinder engine but it established the aluminium backbone chassis design later used in the significantly more beefy Ford 4.7 V8 mid-engined Mangusta and Pantera models. Front engined luxury saloons using the same Ford V8 engine were all produced by De Tomaso in the form of the Deauville and Longchamps models to compete with the likes of Mercedes and Jaguar. The Deauville pictured below is certainly very XJ-like to look at. As a callow youth getting interested in exotic cars in the ’70s and ’80s I seem to remember Panteras having a bit of a reputation for catching fire. Not sure if this was down the dangerous combination of Italian electrics and fuel thirsty V8 engines with maladjusted carbs, a particular design issue or just poor maintenance through Ford main dealers. The fact remains that you really don’t see many De Tomaso’s on the road these days. Well I don’t see them! Facel Vega Designer Jean Daninos intended his cars to be the epitome of French automotive engineering. Whilst this was a fine aspiration – there was initially no suitably large, powerful and reliable French built engine to power the cars. Consequently the Facel Vega flagship model was powered initially in 1954 by the De Soto Firedome Chrysler 4.5 Litre Hemi engine delivering around 180bhp. By 1960 engine capacity had gradually been expanded to 6.3 Litres and power had been increased to 360bhp which translated to a top speed for the HK500 model of 147 mph. Later attempts were made to move to an entirely French built model with the Facellia but the 1600 CC motor was underpowered and lacked development and the company foundered before it and subsequent power plants could be adequately developed and refined. This was a real shame as the FV, FVS and HK500 models generated great excitement and interest. Stirling Moss for instance was an early adopter and used one as his daily driver. The necessary investment and refinement of car and engine just didn’t take place however and the Facel marque came to an ignominious end in 1964. Founded by the Walklett brothers in Woodbridge, Suffolk – Ginetta created a wonderful and range of cars which successfully competed in sports car races from the ’60s and under different ownership to the present day. Initial small 4 cylinder engined G1 and G2 cars produced in the early ’60s were briefly replaced in 1964 by the G10 and G11 cars utilising the eponymous Ford 4.7 L V8 as used in the AC Cobra, Sunbeam Tiger and TVR Griffith/Tuscan. The late ’60s and ’70s saw a return to smaller engines with the G15 and G21 race and road cars respectively with a return to V8 engines with the Rover (nee Buick) 3.9L V8 in 1983’s G33. Created by John Gordon & Jim Keeble who drew upon their respective knowledge of chassis design and racing to create a fantastic combination of sturdy British chassis, beautiful Italian bodywork (unusually executed in fibreglass), sturdy Chevrolet V8 power and De Dion rear suspension. Use of proven American engine in the form of the Corvette V8 was a no-brainer but the master stroke was enrolling the services of a relatively unknown 21 year old Italian designer to design the bodywork – Giorgetto Guigaro who was at that time employed by Bertone the Turin based coach builder. Sadly only 100 cars were built but most of these survive in the hands of enthusiastic owners but the cars were a major influence on Giotto Bizzarrini who adopted the Corvette V8 and De Dion suspension for use in his Iso Rivolta, Iso Grifo and Bizzarrini Strada/Corsa designs. Having seen the Corvette V8 very effectively exploited in the Gordon GT/Gordon Keeble, Giotto Bizzarrini wasted no time in using the same engine (and De Dion rear suspension) in his designs for the Iso Rivolta and the Iso Grifo. Using the same technique he’d used on the Ferrarri 250 GTO – Bizzarrini placed the engine well back in the engine bay to allow the frontal area of the car to be lowered and improve overall weight distribution. Onward development of the Grifo concept continued with the Bizzarrini badged Strada/Corsa cars. The Jensen brothers (Alan & Richard) started off in the mid 1920’s by creating hill-clmb specials based on Austin and Standard chassis. After a brief foray into coach, tuck and van design & construction they set-up Jensen Motors Ltd. in 1934 specialising in coach-built sports cars. In designing and building bespoke bodies on chassis from Standard, Singer, Wolseley and Morris – they competed with a certain William Lyons who’s Swallow company eventually became Jaguar . The company achieved a great PR coup by building the very 1st Jensen car in 1935 for Clark Gable. This set the Euro/US hybrid theme for Jensen by using a Ford chassis along with a 3.6L Ford V8 engine. Jensen Motors were up and running and a number of variants on the Gable car followed incorporating Ford V8, Nash straight-8 and even Lincoln V12 engines. The war and immediate pos-war years saw the production of ambulances, fire engines, aircraft seats, bomb casings, commercial trucks and coaches before focus was resumed on sports cars albeit – the construction of sports cars for other manufactures such as the Austin Healey and later the Volvo 1800S. The handsome fibreglass bodied Jensen 541 utilised a big Austin 4L engine before a return to Jensen’s Euro/US hybrid roots in the early ’60s with the whacky looking but potent CV8 with its whopping great 5.9L “Golden Commando” Chrysler V8. Although the Interceptor name had been used for an aluminium bodied creation in the 1950’s – the name is much better known in association with the fabulous luxury GT produced by Jensen between 1966 and 1976. The Jensen Interceptor continued to use Chrysler V8 engines in 4.5, 59.9 and 6.3L capacities. Its stylish bodywork was an amalgam of design input from Touring of Milan, Vignale and Jensen’s in-house designer Eric Neale with initial body manufacture being carried out by Vignale before production was shifted to West Bromwich. The car’s elegant appearance was set-off by the innovative and for the time enormous wrap-around glass rear tailgate window. A convertible version was offered during the MkIII phase of production and there was also an innovative 4 wheel drive car (the FF) which utilised the Ferguson Four Wheel Drive system. Brian Lister who sadly died in December 2014 was the man behind the development of Lister sport cars in the 1950s. Lister is perhaps best epitomised in the famous and successful Knobbly-Bodied Lister Jaguars which were raced enthusiastically by such great characters as Archie Scott Brown up until his untimely death when he crashed at Spa Francorchamps in 1958. In1959 – Lister enlisted the services of Frank Costin the highly respected aerodynamicist and fellow constructor (Costin provided the “Cos” to Jem Marsh’s “Mar” in Marcos) to create a more “slippery” car. 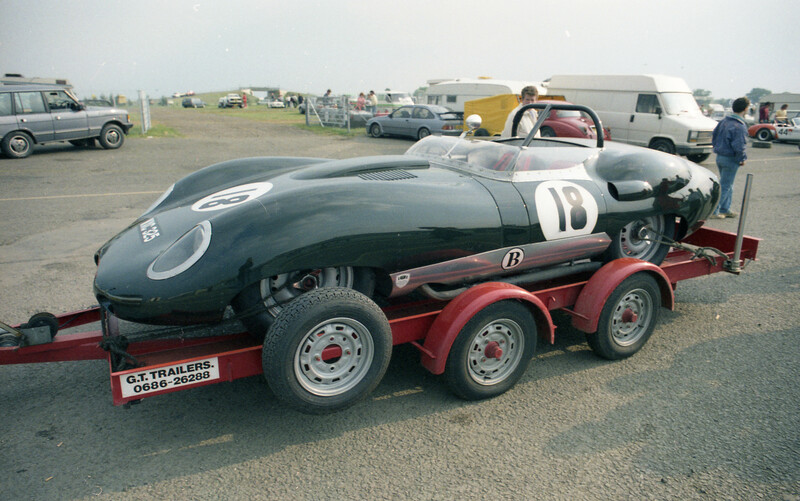 The new super slippery Lister Costin race car used the Chevrolet Corvette V8 engine but it’s front engine layout was already starting to lose out to the increasingly popular mid-engined designs of the late ’50s and early ’60s with such cars as the Cooper staring to sweep the board in sports car races. Lister Chevrolets accounted for 16 of the total production run of 50 Lister cars. When Brian Lister stopped racing his own cars – he was employed by the Rootes Group to manage the 1963 Le Mans racing programme for their own Euro/US hybrid – the Ford V8 powered Sunbeam Tiger. Eric Broadley was the founder of this thankfully revived marque. His early race cars brought him to the attention of Ford who recruited him to create their Ford GT40 race car with the sole intention of beating Ferrari. As the GT40 project neared completion – Broadley returned to Lola to kick off the creation of his very own masterpiece – the Chevy engined Lola T70 which went on to achieve great success in Endurance and Can-Am racing. For most people – Formula 1 is the first thing that will spring to mind at the mention of McLaren but their early success as a race car manufacturer was in the Can-Am series for sports cars which ran between ’66 and ’74. The McLaren M1 represented McLarens 1st foray into sports car racing during the early ’60s and as such it actually used a modified Elva chassis fitted with a small block Chevrolet V8 engine. The fully in-house developed M1A followed and this was followed by the M3 used from the start of the Can-Am series in 1966. The M6A came along in ’67 which proved to be highly successful in the hands of Bruce McLaren and Denny Hulme. In ’68 the M8 continued McLaren’s dominance of the series culminating in total dominance in ’69 when the M8B won all 11 races. Tragically – Bruce McLaren was killed in 1970 whilst testing an M8D at Goodwood and McLaren eventually withdrew from the Can-Am series in ’72 as Porsche took over the dominant position with their all conquering 917 in order to focus on Formula 1 and Indy cars. The enormous success of McLaren in Can-Am racing effectively funded their increasingly important Formula 1 programme. Established by Henry Frederick Stanley (HFS) Morgan this historic marque initially built lightweight 3 wheeled cars following the creation of an initial prototype in 1909. They successfully tapped into the then fashionable craze for lightweight cycle-cars by creating small 3 wheelers combining a light weight tubular steel chassis powered by a variety of motorbike engines thereby delivering amazing power to weight ratio. Development of the 3 wheeler cars continued after WW1 and this resulted in the creation of the highly competitive Super Aero and Super Sports cars with many speed records and successes on race tracks, trials and hill-climbs secured along the way. Revolutionary development in 1936 saw the creation of the Morgan 4-4 with the numbers representing “4 cylinders” and “4 wheels to distinguish the cars from the preceding often 2 cylinder and 3 wheeled cars. This radical move saw the introduction of a necessarily more sturdy ladder chassis to accommodate the more conventional 4 cylinder engine, associated transmission and 4 wheel suspension. To maintain a good power to weight ratio however – a wooden (ash) frame was utilised from which light metal bodywork was hung. Coventry Climax and various Standard engines featured in these cars and in more rare experimental Plus 4 Plus cars but a big step forward came in 1966 when a 3.5 Litre Rover (nee Buick) V8 engine was fitted to create the Morgan Plus 8. This very quick car cemented Morgan’s racing success and onward development (e.g. the introduction of an aluminium chassis) and the eventual creation of the Aero-8 secured the survival of this venerable marque. It’s nice to see however that history and tradition that is so synonymous with Morgan has not been forgotten as they resumed construction of 3 wheeler cars to the delight of a new breed of 3 wheeler enthusiasts. The Rootes group decided they wanted to join the American/British hybrid club by following the example set by AC with the Cobra. The selected recipient for the V8 heart transplant was the humble Sunbeam Alpine. Interestingly – instead of awarding a contract to Carol Shelby to build the cars for them in the USA – Rootes opted instead to use Jensen in the UK’s equivalent of Detroit – West Bromwich! Series 1 Sunbeam Tigers benefitted from a 4.3L Ford V8 engine to be later upgraded in S2 form to Ford’s 4.7L engine. I’m not a particular fan of the Sunbeam Alpine/Tiger body styling but it is good to see Tigers dicing with their similarly engined brethren at historic events. John Tojeiro was a pioneering Portugese/English car designer who created the first Lister racing car and the Ferrari Barchetta influenced Tojeiro Bristol which AC adopted and modified into AC Ace. Probably influenced by Carrol Shelby’s successful pairing of a Ford 4.7L V8 with the Tojeiro designed Ace to create the Cobra – John Tojeiro also utilised the Ford V8 in his Tojeiro Ford GT race car. Other variants utilised more lowly Coventry Climax and “compact” and lightweight Buick V8 engines (later to be become the Rover V8). Interestingly – the Tojeiro GT was a mid engined car with Hewland gearbox hanging out the back. TVR derives from 3 letters extracted from the 1st name of the original creator of this Blackpool marque – Trevor Wilkinson. The Griffith model was named after Jack Griffith a Long Island Ford dealer who experimented with shoe-horning a Ford 289 V8 engine into the diminutive MkIII Grantura body/chassis – thereby creating the TVR Griffith 200. The Griffith 400 was fitted with a more powerful Ford 289 HiPo Windsor V8 engine churning out around 271bhp . There are other differences between the 200 and 400 cars. The 200 had the rather quaint and dumpy Grantura rear end whilst the 400 had the more aerodynamically efficient Kamm tail with those lovely ban the bomb MkI Cortina tail lights. Further development led to the Tuscan V8 including an experimental FF (Ferguson Four Wheel Drive) model. Later TVRs utilised the Rover nee Buick V8 engine before they moved to building their own engines. There are rumours that this great British sportier is on the cusp of being revived by a business consortium. I sincerely hope they succeed. First published in 1977 and with a foreword by Sydney Allard’s son Alan – this book traces the history of Allard cars from the early Trials Specials, through the J, K, L, M and P cars to the final Palm Beach and GT models. It also covers Allard’s establishment of the British Drag racing scene. Great book with a forward by Jack Sears. It provides fascinating insight into AC as a company and it’s adoption in 1953 of the Tojeiro Bristol design into what would become the AC Ace. It then describes Carrol Shelby’s transformation of the Ace into the fire breathing Cobra to the delight and enjoyment of club racers both sides of the Atlantic. A good read, nice photographs and a wealth of information for Cobra-nerds. First published in 1991 – this book provides a comprehensive history not only of the Jensen Interceptor but also of the origins of Jensen Motors Ltd. formed by Alan and Richard Jensen. It’s chock-full of interesting background, good photos and technical drawings of this great car and its predecessors making it a good read and great reference source. First published in 1976 with later revisions this book describes the historic origins of TVR starting with the original designer Trevor Wilkinson through the many and various phases of ownership. My 1980 edition goes up to the M-series cars associated with Martin Lilley’s period of ownership but covers the earlier Grantura, Griffith, 1800S, Tuscan V8/V6, Vixen and finally the 2500/1300/3000 M series cars. First published in 197991 – this mainly photo based book provides an overview of cars that are or were powered by V8 engines from saloons, through sport cars to out and out race cars. It covers mass produced cars, specialist manufacturers and unique specials.